Want to increase your email subscribers fast? You’ve come to the right place! Your email list is probably the most valuable asset you’ll ever have as a blogger. Your website could shut down, traffic from Google and the social media channels could disappear, but as long as you have your mailing list, you’re still in business. Since having an email list is so important, you would want more email subscribers. Having more people in your email list is a surefire way to grow your business faster. In order to get more subscribers, your opt-in forms and offers have to be very good. A good opt-in form will help you get more leads without needing more traffic. 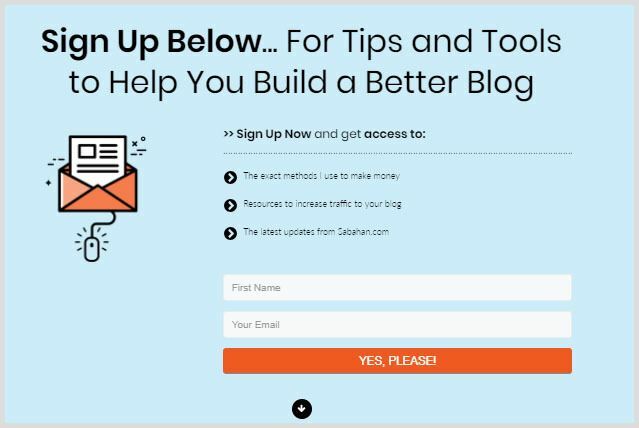 So in today’s post, you’ll learn how to increase your email subscribers by creating highly persuasive opt-in forms without needing any more traffic. If you’re up for it, you can turn these list building strategies into a 7-day challenge. Let’s see how many you can implement on your own website. If your answer is so that they could get the latest updates from you, that’s not enough. Nobody wants to subscribe to another email newsletter without getting an immediate benefit. People want it now, not sometimes in the future which may or may not arrive. So you’ll need to bribe your visitors into giving their email address by offering them something called a lead magnet or an optin freebie. These are incentives that solve a particular problem your readers are facing. Next, you can reframe your offer by changing from “Subscribe to Email Newsletter” or “Sign-up for the latest updates” to something that is benefit driven. For example, identify the feature of your freebie and then add “This will help to…“. 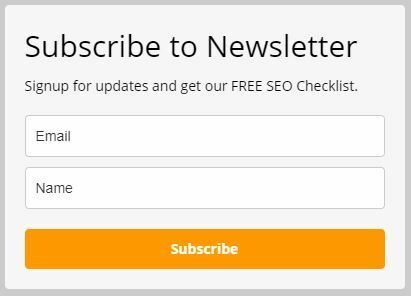 As you can see, spelling out the benefit the visitor will get from subscribing makes the opt-in or lead capture form immediately more persuasive. In this case, your visitors will learn how to optimize their blog and improve their rankings fast. Make your copy benefit-driven by spelling out the immediate benefits the visitors will get. Consider using the word free (or add a price tag) in your offer. Consider adding a specific image of the freebies/lead magnet. Adding a professional looking image increases the perceived value of your offer. Avoid using a generic text for your submit button such as “Subscribe” or “Sign up”. Use a call-to-action text like “Let’s Go!”, “Download Now” or “SEND IT TO ME!”. Try to relieve concerns over being scammed or harassed. You can include something like “We hate spam. Unsubscribe anytime”. The less information you ask for the better. This improves your email signups. You can ask for the email and perhaps the first name for personalization. So instead of “Hi”, you can greet your subscriber with “Hi Jim”. Consider creating a dedicated landing page for your opt-in form – you can send people who ask about how to get more cool stuff from you. You can also link to this landing page if you are doing guest blogging. You can improve your sign-up rates further by offering a specific opt-in offer. Running more than one offer on your website makes it possible to appeal to different segments of visitors. This will result in improved conversion rates more than what a typical, single “catch-all” offer can achieve. It also enables you to create segmented email lists. This is powerful as you will be able to send highly targeted messages to exactly the right people. When you know exactly what your readers are interested in, you’ll make more money from your email list. 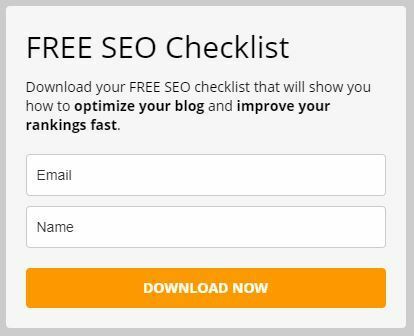 Specific blog posts – you can see an example on my SEO Tips and Tricks post where I offer a SEO checklist that’s only available from that post. Each category – this is also something that I’m planning to do here at Sabahan.com. But what if you don’t have an opt-in offer available? You can adjust your message to target that specific audience instead. Adjust the message to target the particular audience who visit the email marketing category. Drive home what’s in store for people when they opt-in. A lightbox opt-in forms (sometimes also called pop-ups) are usually shown on page load or when the user is about to exit the page. Sometimes they are seen as intrusive and can be annoying. But it has been shown time and time again that they simply work. Currently, I am using Thrive Leads which helps me create my lightbox. Thrive Leads comes with a huge selection of ready-made opt-in form templates so you don’t have to design yours from scratch. Check it out and take advantage of the one-time, non-recurring fee of only $67 and see it for yourself (it also comes with a 30 day money back guarantee). Instead of using the normal lightbox, I’m using the Scroll Mat (sometimes called the Welcome Mat), an enhanced version of the normal lightbox. A Scroll Mat turns any page to a full-screen opt-in form that’s displayed immediately on page load when a visitors arrives on your site. Thrive Themes has found that showing the lightbox instantly on page load is more effective at converting visitors into new subscribers. It’s even more effective than a lightbox that was triggered by exit intent. The basic idea of exit intent is that you make an opt-in lightbox appears the moment a visitor shows that they’re about to leave as demonstrated below. For me initially, I was a bit apprehensive as I don’t want to annoy my visitors with pop ups but my results have also shown it’s one of my best converting opt-in forms. This is an ongoing experiment and I believe I can improve the conversion rates further by using a more specific offer and by showcasing a more exciting picture. I only show the popup once for every 7 days so as not to annoy my visitors. And it will only be shown when the visitors land on a blog post or a category page. So it’s not the first thing they’ll see when they land on my homepage or blog index. You can watch the video below to learn how Thrive Leads works. If you are starting out, I recommend pairing Thrive Leads with MailerLite. requires an immediate response – yes or no? To improve your conversation rates, you can try implementing the recommendations in point #1 above. Here’s the thing though, don’t simply use popups, scroll/welcome mats or any other opt-in form types simple because I or some other bloggers use them. Instead, you should run your own test to see what works best on your site! So this is where the A/B split testing comes in. A split test or A/B test is a test that you can run to compare two different versions of an opt-in form to find out which one gets you the most signups. Don’t worry, A/B testing is not rocket science. In fact, it’s pretty easy to implement if you’re using the right tool. Why is running an A/B split testing important? Because it will help you get more leads on autopilot with the same amount of traffic. For example, if your blog gets 100 visitors per day and only 1% of them opted-in, that’s one new subscriber per day. Using an A/B testing, you can improve your conversion rates and possibly get 2, 3, 4 emails or more per day with the same number of visitors. Fortunately, this is very easy to do if you are using Thrive Leads. It’s the opt-in form designer that I am currently using and I will use it as an example. You would want to create a variation of your opt-in forms and start an A/B split test to find out which one converts better. Opt-in form types – lightbox popup vs scroll mat? Create different offers – find out which offer resonates more with your visitors. Or make it smaller or simpler vs long and comprehensive. Framing of the offer – test the title, subhead, and text copy. Add/remove bullet points, paragraphs of text. Opt-in form designs – test different freebie image, the colour of the submit button, opt-in form layout, minimal vs detailed template etc. Rinse and repeat – continue testing and tweaking to improve your conversion rates. The reason why you’d want to test the big elements first is that it can be difficult to get a statistically significant result. If you’re just testing something small such as the text on your submit button “Get It Now” vs “Download Now”, you would need tons of traffic for the test result to be significant which can take a very long time complete. That said, you can test the smaller elements later once you’ve found a winning opt-in form and the button copy is a good one to start testing on. Testing different offers is one of the most powerful ways to increase your opt-in conversion but creating different offers can be time-consuming. Instead, what you can do is find ways to re-frame your existing offer, and modify the offer to match the frame more closely. One good A/B test you can conduct is to test a 1-step opt-in form vs a 2-step opt-in form. A 1-step opt in form is just your normal form with the name/email textbox, while the later appears as a link, a button or graphic which launches the actual opt-in form when clicked. Two-step opt-in forms are powerful because they use the power of micro commitments. The idea is that, if you’ve already made a commitment to something, you’re more likely to follow that path of action and are less likely to change your mind about it. So when you click on the text link or button, it shows that you do want to get the thing that was advertised. That click is the micro commitment which will drive you to complete the process such as fill out an opt-in form when presented with one. 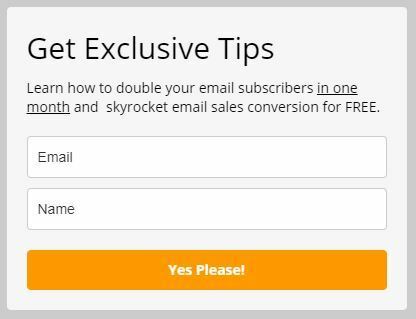 You can use Thrive Leads or any other email signup form designer to create these two-steps opt-in forms. Do you know that the About page is one the most visited pages on any website? People love to get to know the person or company behind the website to learn more about what they have to offer. It’s a go-to page for new visitors who are curious to know more about you and your business. So this is the perfect opportunity for you to get in touch with your visitors by adding your opt-in form to your About page. Use a different wording than what you normally use throughout your blog. Add two opt-in forms in two location – one right after the opening paragraphs, and another one at the end of the page (for those who read the whole page). Here’s how my 2-step opt-in form looks like in my About page. Instead of having an opt-in form filled with text, you should also include an image that represents the opt-in incentive. If you offer a free ebook, have an ebook cover graphic to visually represent your offer. If you offer a pdf checklist, take a screenshot and make it looks good. A visually appealing image can increase the perceived value of your offer, makes the benefit more tangible and increases your conversion rates. You can go to places like Fiverr to get this done cheaply for as low as $5. Additionally, you can purchase some good looking ready-made templates which you can customize from Creative Market. If you are the DIY type, you can give Canva or PicMonkey a try. There you have it, 7 ways to increase your email subscribers fast. You can turn this into a 7 days email list building challenge if you are up for it! In addition to social media marketing, your list building should remain a priority in your content marketing effort. If there’s one thing I should mention before I end this article – don’t be shy about advertising your opt-in offer. Make it obvious for your visitors they’ll get something highly valuable if they opt-in for your offer. If you are too subtle, fewer people will see your email subscription forms and you may miss out on potential visitors who may become subscribers. How to increase subscribers to newsletter? There’s need to be a balance. If you are too aggressive, you may annoy your visitors who don’t opt-in. Either way, you should run an A/B testing to see what works for your own website. Which of the email marketing strategies above have your implemented or are planning to implement in your email list building effort? I’d love to hear your experience in the comments below! valuable tips. I tried Mailerlite free, but they didn’t approve. That is too bad. You can give MailChimp a try. It’s free for the first 2000 subscribers but some other advance features are not available in the free tier. Glad you find it useful! Thanks for reading! These are awesome ideas! I will definitely be using some of these! Good to know you find email marketing strategies useful Nadia. Thanks for reading. Thanks Katie. Glad you find the email marketing strategies useful! These are great tips Victor! I totally agree with creating targeted lead magnets on specific blog posts. I second that Tiffany! My highest converting opt-in forms are those on specific blog posts with targeted lead magnets. Wow, Victor! Thank you for these awesome tips! Great tools! Anytime Stephen! Glad to know you like the tips! Thanks Jen! Glad to know you find them useful. Such an informative post. You gave me so many ideas to try! Do you use Thrive Leads for all the opt in examples you showed in this post? Thanks so much! Thanks Jen. Yes I use Thrive Leads for all of them. Except the first few examples, they are created using MailerLite. Great tip about running targeted opt in’s for different categories! I’m working on that now.